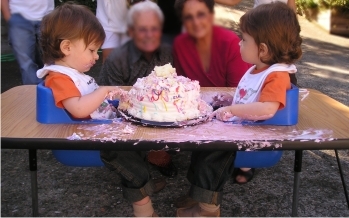 There are not many options when it comes to an actual "twin highchair", though there are some feeding tables for twins which can function the same as a highchair would. There is a wide range of single high chairs to choose from, and if you have the space, you may want to just purchase two standard highchairs for twins. For most parents, the decision will be based on available space in the home and then, of course, cost. Having a comfortable set-up will make feeding twins a little less hectic. 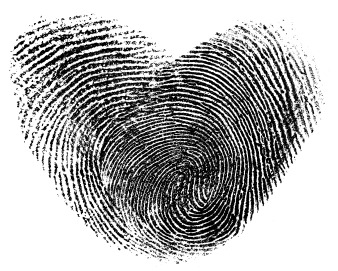 If you're not sure, read on about our recommendations. 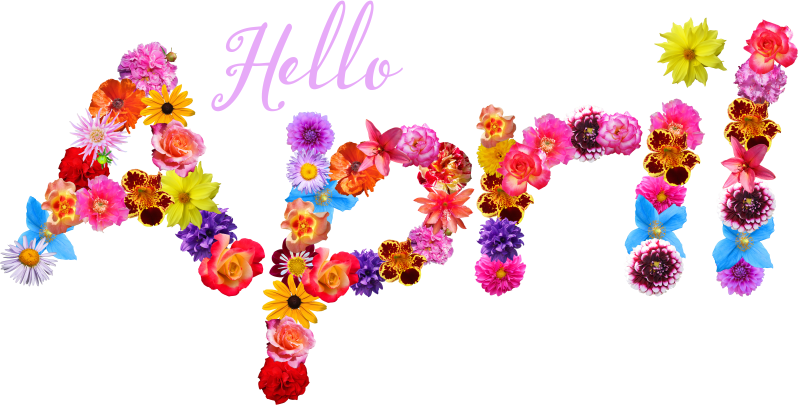 *We try to keep this page current, but prices and manufacturer models may change over time. 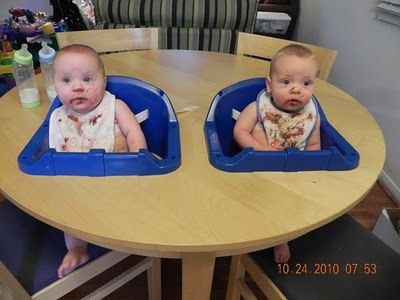 This is, hands-down, the best twin highchair (or feeding table) available on today's market, in my opinion. Of course, I own one. So let me tell you a bit about it. 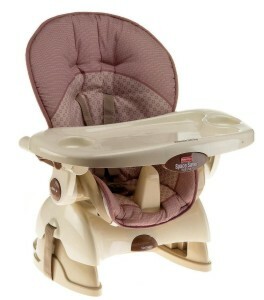 This highchair for twins is durable, easy to clean, and will hold babies/toddlers up to 35 lbs. It has a relatively compact size at 24" wide by 48" long and adjustable legs that go from 19" to 27" high. It will even fit neatly against a wall. The two seats can face forward or face each other and have a safety strap. It works wonderfully as an activity table as well. You can pick one up at Justmultiples.com with your choice of five table top finishes. Is sells for around $285, but usually includes free shipping. This is still a bargain considering the price of two separate, full size highchairs. The Table For Two, though not a high chair at all, is an innovative and patented product designed to easily bottle feed twins at the same time. You can also use it to feed first solids, so I wanted to include it here in our guide. I must say, if this was around back when my twins were born, I'm sure I would have had one! The main base is constructed of 100% high density polyeurethane foam, which is extremely sturdy and comfortable. 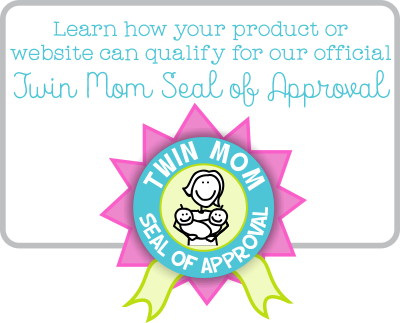 There is a safety harness provided to securely buckle your twin babies in. The cover is made of 100% water resistant polyester so it can easily be wiped clean. For added comfort and style, Table For Two comes with a set of decorative padded seat inserts and headrests with fabric of your choice (there are a ton of choices). Simply velcro the inserts in and out, so you can easily toss them in the washing machine if they get dirty. This product also features a bottle holder on each side so you will never spill your milk or mix up your twins' bottles again! Includes a convenient carrying handle, located on the back of the product--this is great for moving it around the house or taking it on road trips, etc. 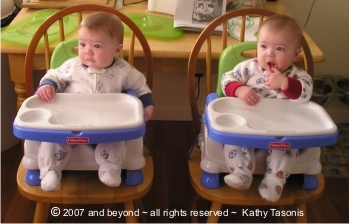 The Table For Two feeding system can be purchased at Trends In Twos, the online boutique for twins and their families. Pick one up for $269 plus shipping. This is essentially a portable highchair. But boy is it handy for twins! In fact, many parents use a pair of these as their main twin highchairs. It features a snap in tray that is dishwasher safe, and a handy carrying strap. The Fisher-Price Healthy Care Booster Seat is extremely compact, affordable, and versatile. I purchased a set of these just for travel...They are great to take to grandma’s house when she baby-sits. It rates tremendously high from the many reviews I have read and can be obtained for only around $25. *The photo is courtesy of a fellow twin mother who was kind enough to let me use this photo of her adorable little boys in their Fisher-Price booster seats. Thanks, Kathy! I came across this space saver in one of my many searches for twin highchairs. Although, it's not a special "twin" highchair, it has all of the features of a full-size high chair without taking up the space. It consistently gets great reviews at Amazon.com . This is also where I read a review from another mom of twins. She apparently purchased two of these highchairs for her twins because of lack of space in her home. Amazon.com has even posted a picture of her twins in two of these chairs. You can get one for approximately $50 to $80 and they are available in a few different prints/models. I just had to add this one! I found it in a recent web search (I'm always trying to stay current). If you have the right tools and some carpentry skills, this is the way to go. The instructions on how to build this puppy can be found on various websites on the web, but I believe the original came from ikeahackers.net - same credit goes for the photo. The link will take you to the full step-by-step guide to creating this totally cool hack for yourself and your twins.